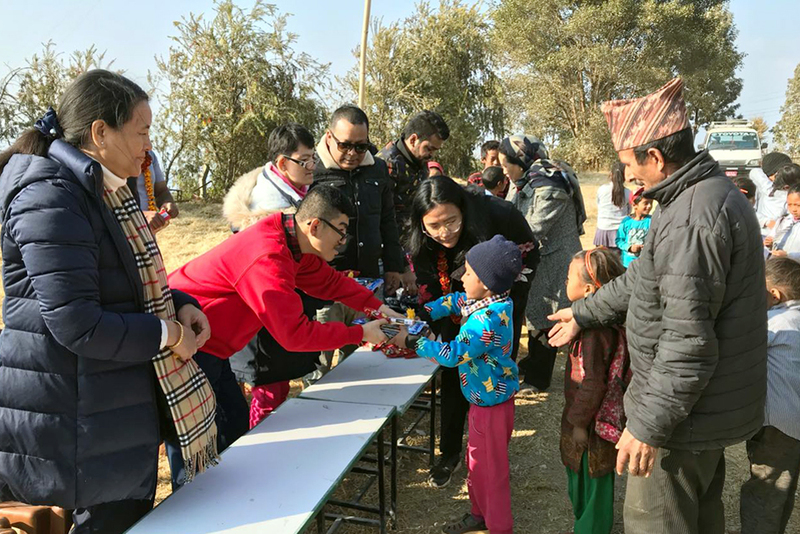 Ninety underprivileged students have benefited from a Sweater Distribution program organised in Kavre by Pax Earth on December 27, 2018. 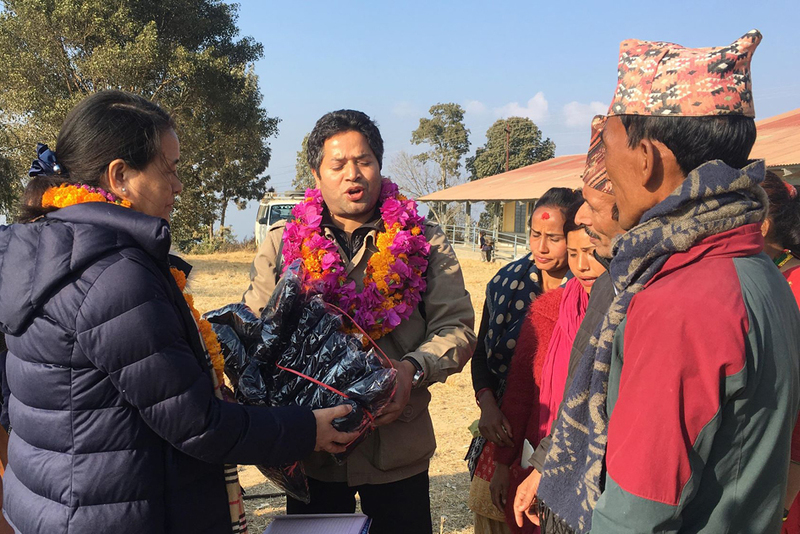 A 10-member joint team led by president Sujan Koirala along with vice president Guna Raj Pyakurel, secretary Manohar Sapkota, treasurer Bal Gopal Shrestha and member Sital Mainali from Pax Earth and sponsors Junu Gurung, Raju Gurung, Safal Gurung, Rosni Gurung and Rashmita Gurung travelled to Shree Kalika Primary School and Shree Raktakali Primary School located in Ward No. 5 of Namobuddha Municipality, Kavre, Nepal and distributed warm woollen sweaters to the underprivileged students. At first, the team arrived at Shree Kalika Primary School located in Kanpur village. The school is running classes from grade one through grade three and has twenty underprivileged students. 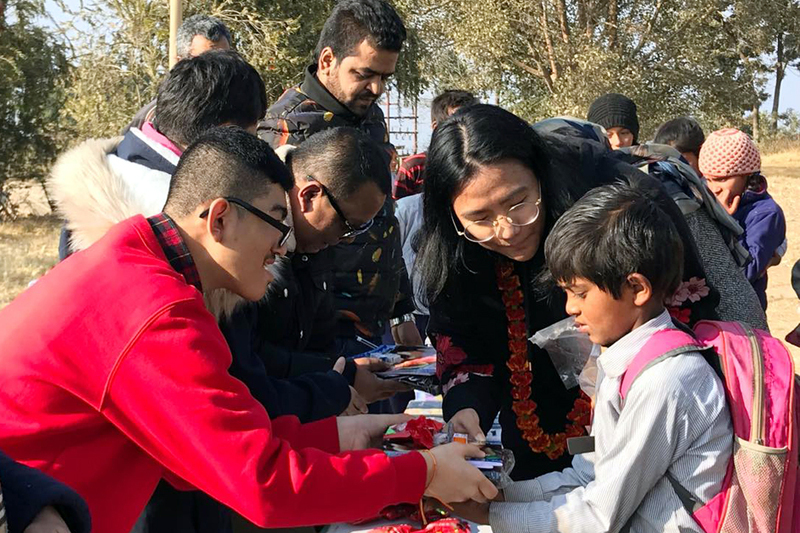 The pax team coordinated with principal Ram Lal Shrestha and the teachers, and the sponsors team distributed the warm woollen sweater to each student. Most of the students were present wearing a pant and a shirt/t-shirt in a very cold weather. The students were quite overwhelmed to receive the warm woollen sweaters and took no time to wear it. Their beautiful smiles are more than enough to reflect how happy they are to wear the sweater. The team distributed a few useful stationeries such as note books, pencils, erasers and sharpeners to the students as well. Besides, the team handed a diary and a ball pen as a souvenir to the principal and two teachers of the school. The school honoured each member of the team with a marigold garland. The principal Shrestha extended a sincere gratitude to Pax Earth and sponsors for arranging the sweaters to these underprivileged students. He has assured to keep the sweater as the uniform of the school so that the students can wear while coming to school every day. The team handed the sweaters and stationery for the three absent students to the principal before heading to Shree Raktakali Primary School located in Kot Timal village. At second, the team arrived at Shree Raktakali Primary School in Kot Timal village. The school is running classes from early childhood development (ECD) through grade five and has seventy underprivileged students in total. 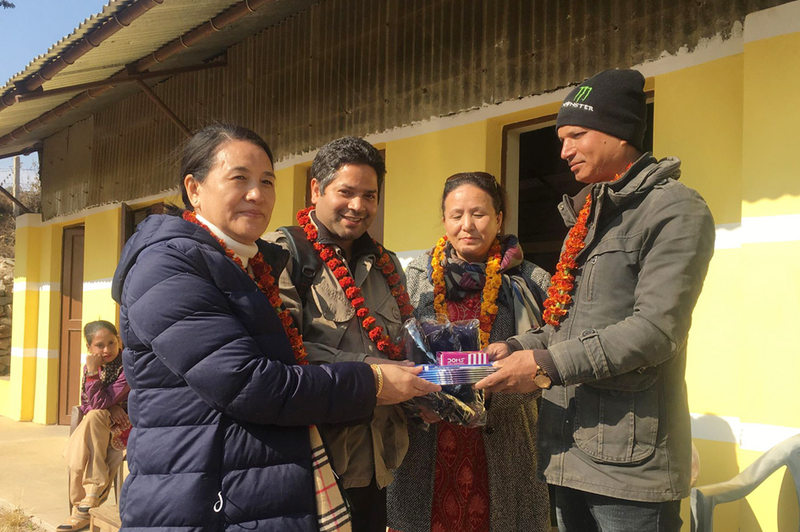 The team coordinated with principal Hira Kaji Tamang and teachers, and the sponsors team distributed the warm woollen sweater to each student. Most of the students were present wearing just a shirt/t-shirt and a pant. It took no time for them to wear the sweaters. They were so happy and delighted to wear. The team distributed a few useful stationeries including note books, pencils, erasers, sharpeners and ball pens to the students as well. Besides, the team handed a diary and a ball pen as a souvenir to the five teachers and a staff of the school. The school honoured each member with a bulk of garland woven from marigold and other locally grown flowers. Principal Tamang extended a sincere gratitude to Pax Earth and sponsors for their generosity for arranging the sweaters to the underprivileged students which has a great value to them in this cold weather. The team handed the sweaters and stationery for the eleven absent students to the principal. Both the schools now have a new school building. The old school building of Shree Raktakali Primary School was destroyed by the great earthquake in 2015 while the old school building of Shree Kalika Primary School was partly damaged. The team was pleased to distribute the sweaters and the stationeries in the premises of the new buildings in both the schools. In addition, the team handed a few toffees and chocolates to the students to add sweetness on the occasion. The Pax Earth is glad to contribute to the education of underprivileged children in one way or other. This program will certainly encourage the students to attend the schools regularly rather than to stay at home to avoid the shivering cold. The Pax Earth is very happy to bring smile in their face with this little effort. 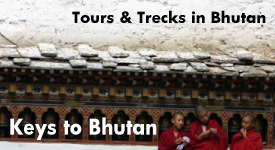 This is solely possible with a support of kind hearted Junu Gurung and her family members coming all the way from Hong Kong. She has been very active to support such programs on behalf of her two differently-abled children. The program was coordinated by president Sujan Koirala. 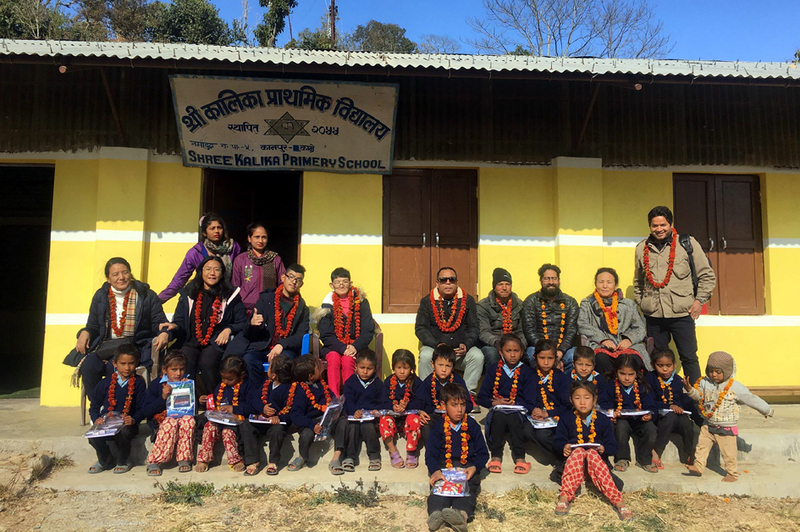 Pax Earth is thankful to Junu Gurung and her family for her kindness to sponsor this program and contribute to the education of the underprivileged children of remote community in Nepal. We would thank well-wisher Suman Vaidya for connecting Pax Earth to Junu Gurung and treasurer Bal Gopal Shrestha for his support. The members of the joint team deserve a great applause for making the distribution program a grand success. Last but not the least, we would thank well-wisher Biswo Ram Basi for offering a smooth and cool drive throughout trip.